Copper River Bag Co. Leather Messenger Bag Giveaway! $183 RV! 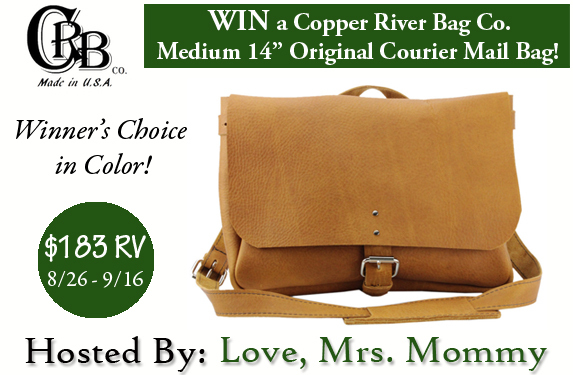 Welcome to the Copper River Bag Co. Leather Messenger Bag Giveaway! Thank you to the sponsor: Copper River Bag Co. I am actually a huge fan of Copper River bags! I've never had one, but I have been eyeing them for over a year now. They're really beautiful, and I would love to have one for my camera! This is a giveaway event I couldn't pass up, on participating in. Good luck everyone! This truly is a beautiful bag to win. "Copper River Bags are designed and handcrafted in Nevada City, California. They are inspired by the mountains, rivers, lakes and the all-around beauty of the Sierra Nevada Mountains. They strive to bring back the quality and craftsmanship of the old-world craftsmen, who designed and crafted bags to last a lifetime and endure all climates." Click here to read Love, Mrs. Mommy's full review! One lucky winner will receive a Copper River Bag Co. Medium 14" Original Courier Mail Bag in choice of 5 colors! Giveaway Dates ~ 8/26 12:01 AM EST through 9/16 11:59 PM EST Good Luck! Disclosure: Love, Mrs. Mommy and all participating bloggers are not held responsible for sponsors who do not fulfill their prize obligations. Love, Mrs. Mommy received a Copper River Bag Co. original courier mail bag at no cost to facilitate the above-mentioned review. This giveaway is in no way endorsed or sponsored by Facebook or any other social media site. The winner will be randomly drawn by Giveaway Tools and will be notified by email. Winner has 48 hours to reply before a replacement winner will be drawn. If you would like to participate in an event like this please contact LoveMrsMommy (at) gmail (dot) com. Lil' Blog and More received no compensation in exchange for this post.